because when i woke up this morning, that's what i had. wasn't because i was drinking, it was because i wasn't drinking. i didn't get enough fluids yesterday apparently and woke up dehydrated, with a splitting headache. i immediately started to replenish the water back into my body, making sure i was properly hydrating myself today. in the mornings my kitchen is intensely saturated with sunlight. 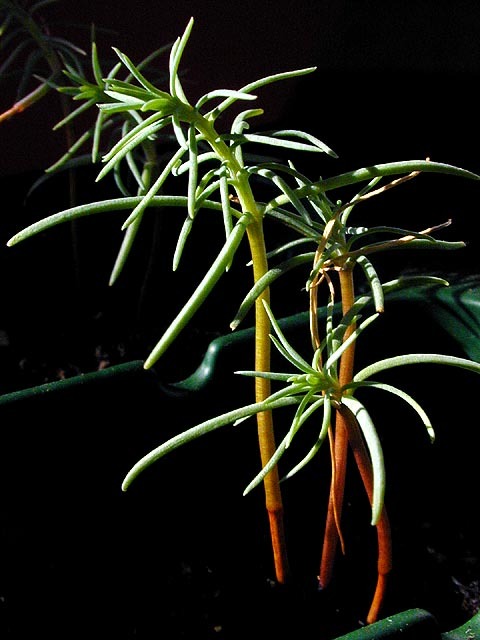 the small sequoias growing on my kitchen dining table were basking in the light. i've had these for over 5 months now. they're very slow growing trees, but they're at a stage now where the stems have sort of hardened into premature bark. soon i'll have to repot them, and i might have to thin them out as well, they're growing in two clumps of 2 and 3. i don't know if they can be separated though, it'd be cool if i can do it, but i'm afraid they have fragile roots. we'll see. i'm kind of surprised they've lasted this long, i garden but i don't really consider myself of having much of a green thumb. laurie, who planted some sequoias the same time as me, her plants have already died (though not her fault, it was an accident). 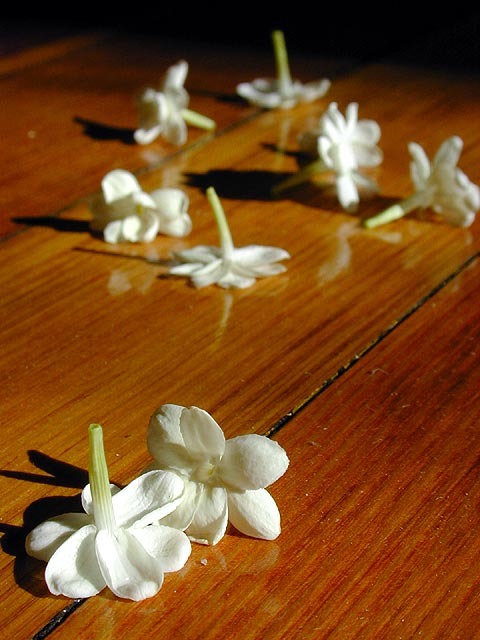 also in the morning sun: spent jasmine flowers littering the hardwood floor. i don't know how well the jasmine plant is doing. i don't think it's getting enough sun, or it could just be adjusting to its new surrounding. if it starts getting sick i'm going to have to return it to my parents. another day of work fog. i don't mind, except i still don't have a desk so i do everything from my living room floor, and it's just not good for my back. i woke up at 9am waiting for instructions that never came and i fell back asleep in the living room, my head still hurting from the "hangover." it wasn't until 2 hours later that i got an aim message asking if everything was all right. apparently there was some server problems and i never received the e-mails. when i did start working, i played my motown cd's. my new favorite song: stevie wonder's "uptight (everything's alright)." but they're all good! i sorted my files today in-between uploading work documents. by files i mean bank statements and bills and other important documents that i should be keeping track of instead of just throwing them wherever. there were manila folders everywhere on the floor, neatly labeled with a sharpie marker. i called the cable company to see how i could return my digital cable box and step down my services now that i know i don't need it to receive almost 100 channels on a cable ready television. i can save as much as $14/month which translates to $168/year. in the middle of the afternoon i had a surprise visitor ring my doorbell. it was the indian woman who lived here before me, i actually bought the place from her and her husband. from the few times i've seen her, she seemed kind of like a grumpy person, definitely a little bit scary. i guess her husband was good cop while she was the bad cop. my mother has a theory that she actually hates me because they could've sold their place at a higher price but instead grabbed at the first good offer (my offer!) that came their way. anyway, she rang my doorbell because she wanted to talk with my upstairs neighbor who wasn't home, so she decided to inform me instead of why she dropped by, which was to deliver a check for some unpaid water bills. i was surprised to see her, me in my disheveled hermit state, but i invited her inside so she could see what i'd done to her former home. to my surprise, she wasn't particularly interested in coming in, and told me she'd take a raincheck on the offer, which was her way of essentially saying, "i don't want to see your place." after a brief exchange of words, she left. a few minutes later however, my doorbell rang again, and it was her once more, back to tell me some more stuff, like how she wanted steve (my upstairs neighbor) to pay for his share of the oil tank that was removed prior to me buying the place (why i had to know this i wasn't sure, but i didn't want to be rude). she also told me that i have to go down to city hall and have them change the name on the water bill to my name, so that she wouldn't continue to receive the bills. once again, why this was important to me, and why she couldn't do it herself, i don't know. "well, enjoy your vacation," she said, and that's when i realized something that was kind of funny, which was she had no idea i was unemployed. i closed on the house on a wednesday and two days later i found myself without a job. she noticed the irony right away when i told her the "good" news, "both you and steve are unemployed, two unemployed guys living in the same condo!" then she added, "for an unemployed person, you certainly seem pretty happy," as i was smiling from the doorway. well, i guess it's true! it's my carefree lazy attitude towards life in general. even though she didn't want to come into the house, i knew she was curious about what i've been doing. just from the doorway, she could see i'd completely changed her color schemes (ORANGE foyer, GREEN living room), and she was happy to see i was still using the doorway carpet they'd left for me, and she also noticed i had put in a new door in the foyer, which i told her was the entrance to a coat closet, opening it up to reveal the salsa red painted inside. i'm sure she'll go home tonight and inform her husband of all these changes. still not sure why she didn't want to come in though. i really would've loved for her to see it. maybe she just didn't want to live in the past, and coming back to her old home might bring back memories. but i asked her about her new place in lexington and she told me they love it, and made a slight crack about how she'd never live in a condo because it's just so terrible having to deal with all the division of bills and expenses. i hope i'm wrong and that she'll come back one of these days, hopefully when i get furniture and make the house a little bit more presentable. once again, another late lunch, i didn't actually eat until 4pm, a couple of mantou buns steam cooked in the microwave along with a leftover tupperware container of beef stuff my parents had made a while back. my parents, which now seems like a regular event, dropped by briefly to bring me even more supplies. my father taught me the first step of making kimchee, which is chopping up a head of cabbage and throwing it into a container with a few scoops of salt. not sure how good an idea it is to make kimchee in my house though, since i don't have a cooking fan, smells have a way of lingering. for dinner, i threw a refridgerated lasagna into the toaster oven for 30 minutes, washed it all done with a glass of egg nog. later, i was glued to the history channel, first a documentary on the history of the m-16 assault rifle, then a history of the russian mafiya [sic]. they got some good shows on that channel the past few days, last night, the history of triad in china. i think it's organized crime week on the history channel.